It's review time! 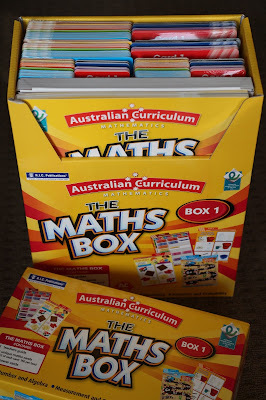 I was contacted by RIC Publications and asked to review their newest addition to their resource line - The Maths Box! I jumped at the chance to get a sneak peak, RIC Publications produce great quality resources that strongly align with my teaching pedagogy. The box was delivered during the week and I was so excited to open up the box that little 1 year old got excited too - he is into exploring at the moment so any chance to see what's inside a new box. 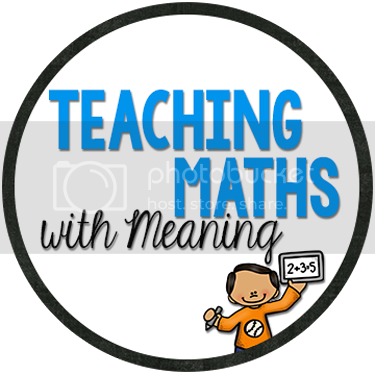 I immediately knew that the Maths Box would be something I would use over and over again (and I would want all boxes just in case I changed year levels) and I knew one blog post simply wouldn't do the product justice. So I am breaking my review into 4 parts to be posted over the next couple of weeks. The cards are colourful, engaging (without being over the top) and durable. Some cards I have seen in the past needed to be laminated, definitely NOT the case with this Maths Box. Simply open the box, take off the plastic wrap and you can start to use the activity cards. I received The Maths Box 1 (click here to see an online sample). 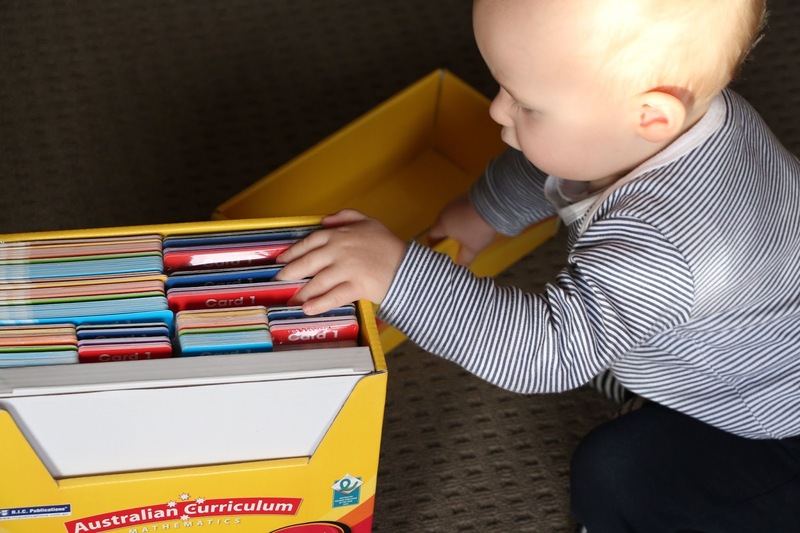 This box has been developed for Year 1 students and aligns directly to the Australian Curriculum. Each box covers the three strands - Number and Algebra, Measurement and Geometry and Statistics and Probability. The Teacher Guide has a Scope and Sequence to show which activities meet which content description found in the Australian Curriculum. I am impressed with the thought and care that has gone into matching activities to the Australian Curriculum. The thing I like about the Australian Curriculum is that we have outcomes to meet and it is up to us how we meet them - so I am excited to see just what activities are on offer! The activity cards are grouped in sub-strands and are colour coded. I LOVE that the cards are colour coded and have a tab that sticks out the top of the card which clearly state what card number they are. 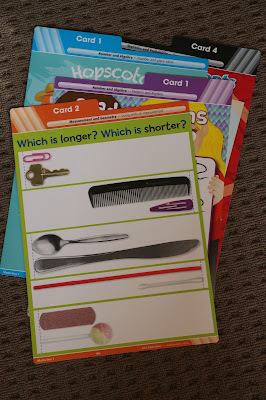 This makes it easy to pull out activities, put activities away and keep the Maths Box in tip top shape - the ease of organisation really appeals to me and my need to keep everything neat and tidy. As shown in the picture above, the Maths Box comes organised and ready to go. I have pulled out a few activities below to show you the difference between the colours and cards. Each activity has an answer card that is colour co-ordinated and repeats the activity card at the top. I really like how this makes it simple to see the activity and correct student's work. 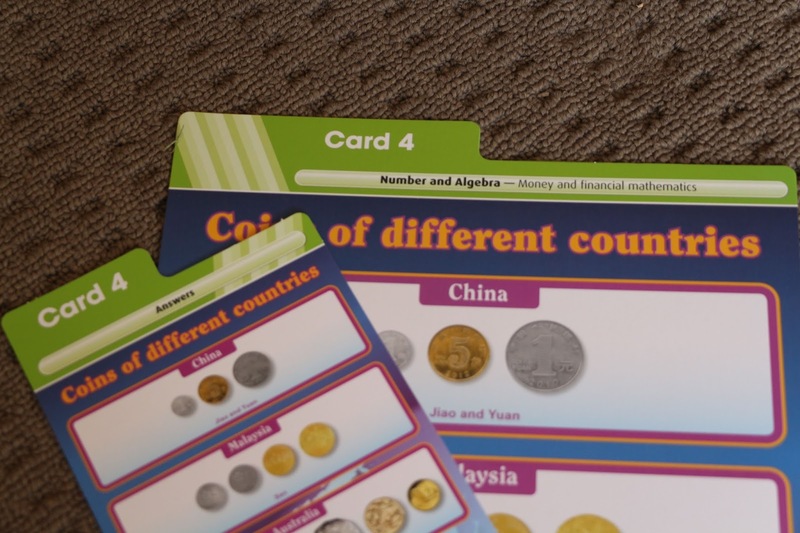 The answer cards are also in the Teacher Guide which makes it so much easier to correct than pulling out each card (unless of course the students are correcting their activities). And a close up so you can see how the strand and sub-strand is listed on each card. I can see how easy it would be to complete assessment as student's work through the cards, therefore making it easier at report writing time. 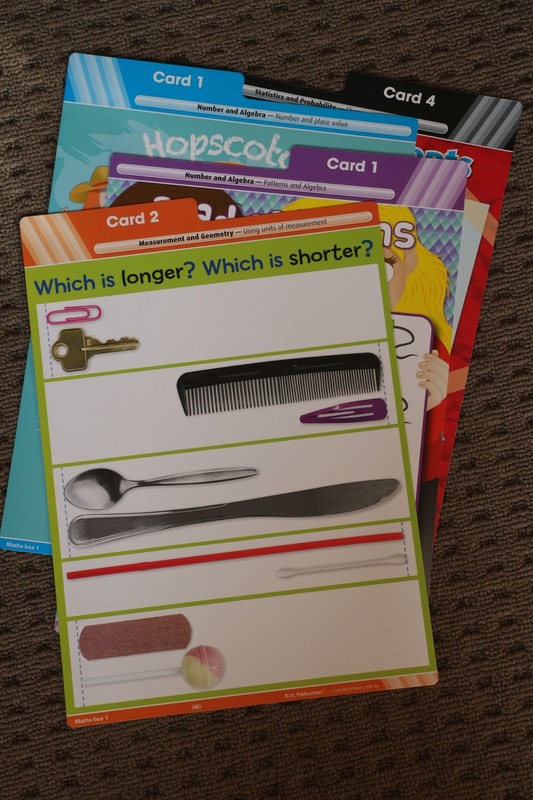 For teachers new to a year level, using the activity cards can help in becoming more familiar with the expectations at that level. 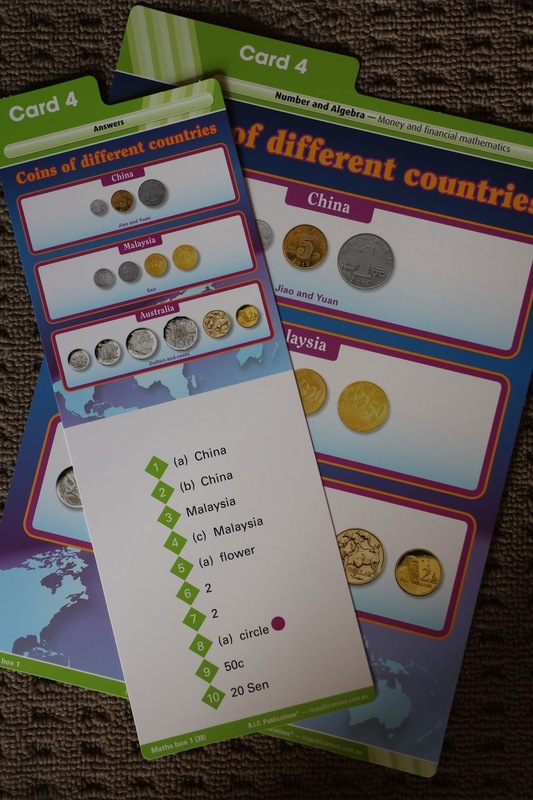 - Mini posters - these aren't perforated to rip out and laminate, however, could easy be removed or photocopied and laminated to keep with resources. If you have a document camera, you could easily put the book under the document camera and display on the IWB. If you want to see more details of what is included in the Teacher Guide, click here and scroll to the bottom of the page and click on your year level. The online samples for each Maths Box are very detailed. Stay tuned for The MATHS BOX! Part 2 coming this week, where I will tell you more about the types of activities and go into more detail about the Activity Cards. By contacting RIC Publications here you can review a FREE Maths Box sample pack for your school. *** Please note: This is not a sponsored post - the opinions in this post are my own.